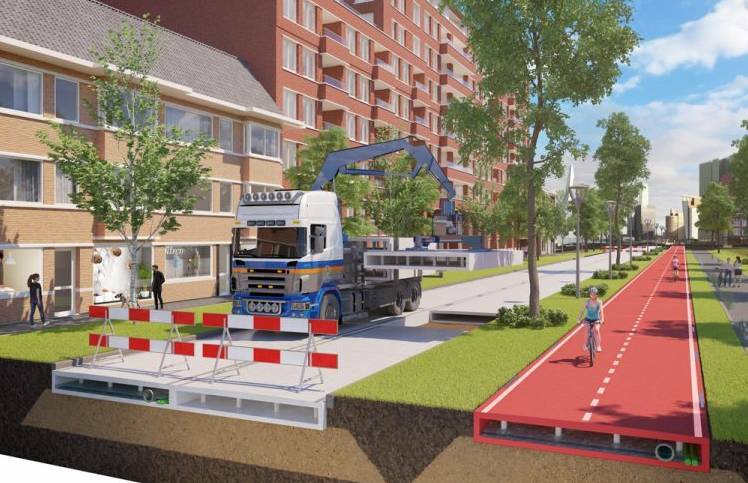 Zwolle is to get what it says is the world’s first plastic cycle path – a 30 metre long stretch of ‘road’ made of recycled plastic which will be used to test if the technology is suitable to be rolled out in more places. The Zwolle bike path will be open to cyclists in September and a second stretch of track will be opened elsewhere in Overijssel province later in the year, civil engineering group KWS said in a website statement. The plastic road concept was launched by KWS in 2015 and since 2016, the company has further developed the project with plastic pipe maker Wavin and the Total oil and gas group. The two pilots will consist of 30 meter long bicycle paths made of hollow prefabricated elements so that water drainage and pipes can be inserted. Their exact location still has to be decided. ‘These pilots mark an important step towards the developing process and success of the plastic road,’ KWS said. ‘The objective is to create a road with a smaller ecological footprint than traditional road systems. When the elements reach their end of life expectancy they can be recycled again, contributing to a circular economy and cleaner environment,’ the company said.